Congratulations goes out to Kenny for winning the 50/50 draw and winning the DVD Movie.... This meet turned out to be a big success and we thank everyone who took part. When we headed out it began to rain and we were all hoping that it would stop. Once we got to our destination everyone was determined to proceed forward. Once at the tunnel we all headed on in and then not too long after, a lot of folks started to feel different things within the tunnel. Cindy appeared to be in contact with the spirit of a small child after being there for about an hour. She was overwhelmed by the spirit in a sense. 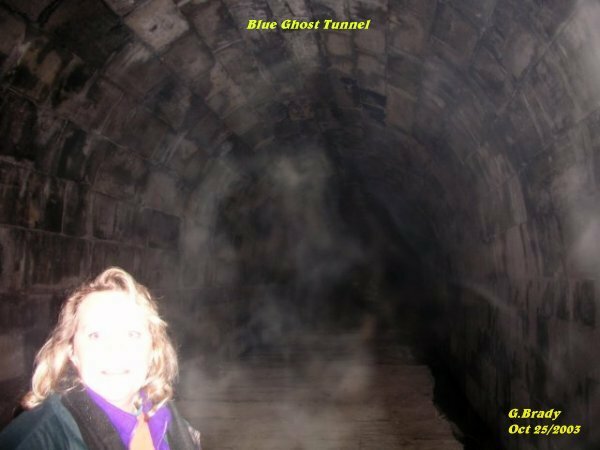 She said she could not get the little girl out of her head and a few times Cindy nearly passed out in the tunnel. At one point Cindy started to get very sick to the stomach and had to be helped from the tunnel. Most folks felt they were not alone, and some saw movement within the tunnel. At some point everyone saw the entrance to the tunnel disappear as if something had entered. 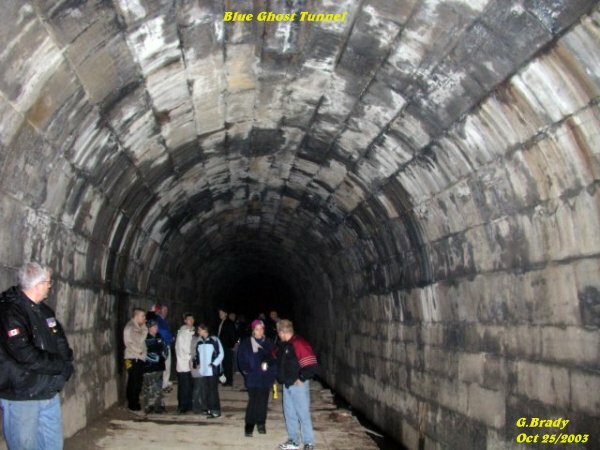 There was a loud banging noise at the far end of the tunnel that everyone heard and when folks approached, the tapping would come to a stop. All in all this night was a night to be remembered by the many folks that attended this investigation. 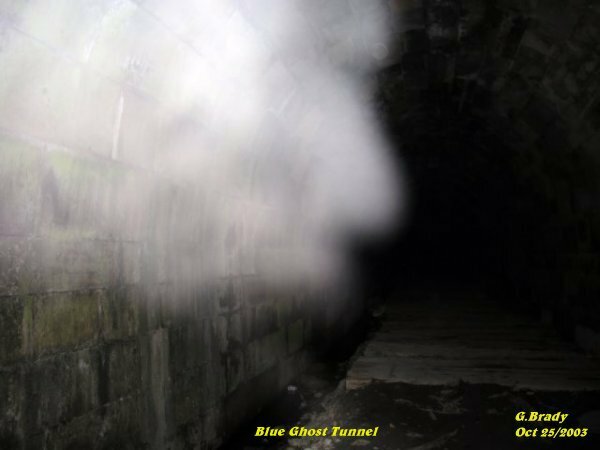 Is the Blue Ghost Tunnel Haunted ????? 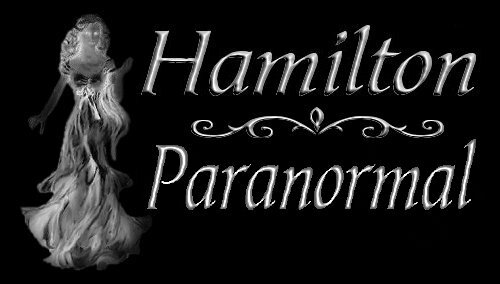 In our opinion and the opinion of many others in attendance for the night, YES it is haunted!!!!! 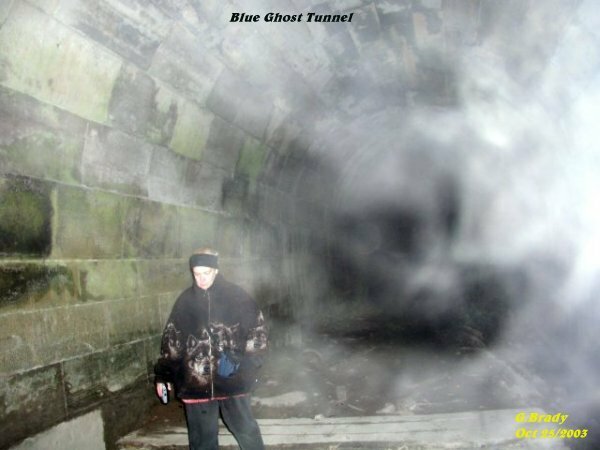 The pictures that are shown in this investigation have paranormal content that we feel are real. All pictures taken were witnessed by those in attendance on the camera.... This of coarse is our OPINION ONLY. It is up to the individual to decide for themselves if what we had captured on camera is real or not, as well as what we had felt in the area at the time the photos were taken! With that said we hope you the viewer enjoy your visit to our site. Pictured above is some of the group that were with us at the BGT. There is no paranormal activity in this photo. To the left of the photo you can make out a side profile of the head of a person in ecto form. Some ecto mist appears to the right side of the photo, complete with some orb activity in the area. After taking much more photos with hardly anything in the photos I got this photo of Cathy coming towards the back of the BGT. It appears as though she had company with her. In the middle of the photo you will see a figure of a dog's head right by Cathy. The dog's head is in black shadow form in the middle of the mist. Shortly after the last picture was taken I got some more ecto mist in the center of the tunnel. 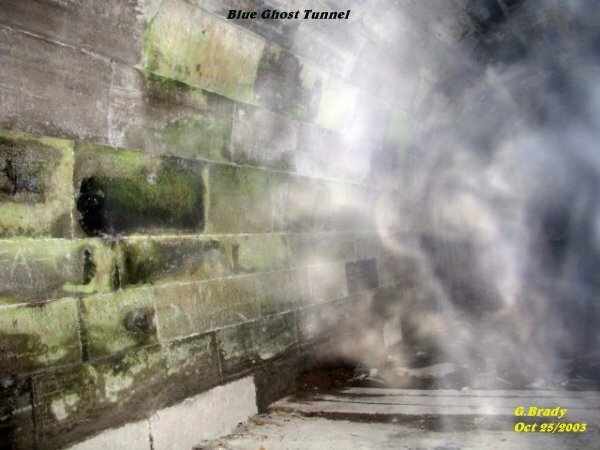 In this photo in the center it appears as though there is a person in the middle of the mist walking towards the wall of the tunnel. In this photo you can see Cindy looking at the camera. Just behind her it appears there was a man in a squatting postition. One arm of the man seems to be pointing up with the index finger raised. 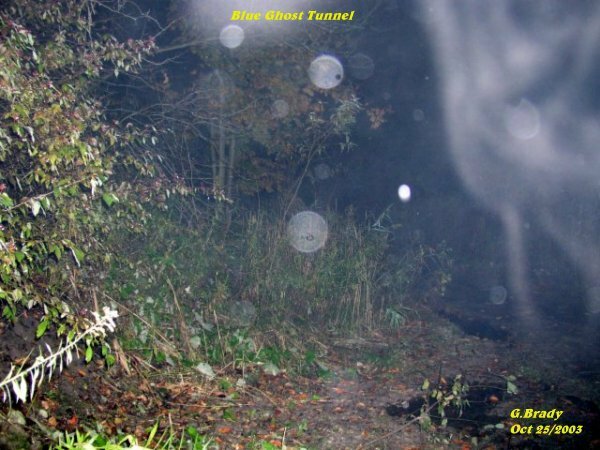 This was an amazing photo and the man apparition was somewhat clear.